Former England captain Michael Vaughan wants Kevin Pietersen reinstated in the Test side to tour India, if his issues with the squad have been resolved. Pietersen, 32, was dropped by England in August for sending "provocative" text messages to South Africa players and omitted from the squad for India. 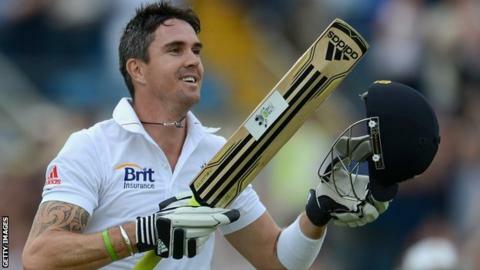 "The issues have to be resolved, but if they have, I would want Kevin Pietersen batting at four," he told Radio 5 live. "I don't think England have ever had a player like him. He's exceptional." England begin their four-Test winter tour of India on 15 November in Ahmedabad, with subsequent fixtures in Mumbai from 23 November and Kolkata from 5 December, before finishing in Nagpur for the final Test which starts on 13 December. Pietersen had said he hoped to be back to tour New Zealand in February but Vaughan believes the batsman could make the difference if recalled earlier. "If (captain) Alastair Cook wants him back in the team and all the issues have been resolved, I would not want to be waiting four games to get him back in," he said. "They could lose four games. It could be 4-0 in India if England are not careful and they don't play spin better. "The venues England are playing at all suit India. They are all low, slow spinning wickets and I wouldn't want to go there without my best players. "I'm sure the selectors would want to see their best players and I'm sure they'll want to pick Pietersen. "We heard (national selector) Geoff Miller talk about it - that Pietersen's still one of the best players in the world and he'd like to see him back in the team, but things need to be sorted out. "Pietersen, if it has been resolved, get him back in for India, because Cook does not want to start on a real bad shoeing. "If you lose in India badly, you then go to New Zealand and they are not a push over any more." Discussions between Pietersen and the England and Wales Cricket Board have been ongoing since the second Test against Proteas at Headingley, when the Surrey man himself cast doubts on his future - a claim he later backtracked from. Pietersen also apologised to former captain Andrew Strauss, who was allegedly criticised in the texts he sent to the South Africans although he denied he offered any tactical advice. "We're not talking about someone who is an ordinary player, we're talking about a maverick," added Vaughan. "He's been terribly advised this year and made loads of mistakes, but if the issues have been resolved and he's given a central contract, which is a year long, you've got to get him in."